Spring is the start of a new cycle as the cold winter frost thaws and plants begin to bloom. The temperatures in spring are still relatively low and the melting snow along with the occasional spring shower increases the humidity in the air – this makes spring a distinctly kapha season. According to Ayurveda, there are three basic biological energies (doshas) in all of us which govern our bodily constitutions. Kapha is associated with coolness and heaviness, which is why kapha individuals are more affected by the cold conditions of spring. Lifestyle changes that include the opposite qualities (warmth and light) can help to restore a kapha imbalance and keep you healthy this spring. Balancing your doshas is not as complicated as you might imagine – all you need to do is make a few diet and lifestyle changes. These changes are aimed at lowering kapha, which will keep your doshas in balance. The best time to wake up is approximately one and a half hours before dawn (brahma muhurtha). However, given our modern lifestyle, most of us would not be able to stick to this schedule, so decide on a specific time to wake up on a daily basis and keep it to within an hour of sunrise. Clean up – according to Ayurveda, proper cleansing is essential for good health, so try not to rush through your morning ablutions. Wash your face and eyes with warm water as soon as you wake up. Practice oil pulling (gundusha) – this is an Ayurvedic technique, similar to a mouth swish that helps to extract ama (toxins) from your body as well as improve your dental health. Establish an evacuation routine – excess kapha is linked to a sluggish digestive system, so daily evacuation is important to prevent the buildup of toxins in the body. Pamper yourself with a massage – garshana is an Ayurvedic dry massage technique that removes ama from the body and promotes lymphatic cleansing. Use a body brush with natural bristles to dry-scrub your entire body as this will mitigate kapha and reduce common kapha problems such as lethargy and sluggishness. Drink a cup of freshly brewed ginger tea (without milk) after your breakfast to promote healthy digestion. Once you are done with your workday, hit the gym before you head home. Kapha qualities include unctuous, heavy, and slow, which means that you will be tempted to skip your evening workouts in spring. It is important to stick to your fitness regimen as daily exercise is essential for kapha balance. Once you get home from your workout, have a warm (but not hot) shower. Use a natural body lotion once you are done as this will prevent dry skin problems – a common kapha complaint in spring. The type of food you eat plays a large role in your dosha balance. You may have noticed that you tend to feel more lethargic and listless after you’ve had pizza or processed foods – this is because these foods aggravate kapha. Instead, pick foods that oppose rather than complement your dosha’s qualities. Balance the cold and smooth qualities of kapha with warm and rough (foods that are high in roughage) foods. This means that foods like broccoli, cabbage, cauliflower, and beans would be good additions. For the same reason, you need to avoid foods like cucumbers, celery, zucchini, and similar veggies than have a high water content. Heating energy is vital for anyone with kapha dominance. This means you should include cooked foods and herbal teas, served either warm or steaming hot. Salads may be healthy, but they are also cooling, which means that they aggravate kapha. For the same reason chilled foods and beverages like frozen yogurt, ice cream, juices, and colas should be avoided. To keep kapha in check, make sure to include foods that have naturally pungent, bitter, and astringent tastes. Avoid foods that have a sweet, sour, or salty taste as they increase the risk of kapha aggravation. Pungent foods that are good for kaphas include bell peppers, radishes, turnips, and raw onion, while bitter tasting foods include kale, dandelion greens, and collard greens. Beans and lentils have an astringent taste and these foods help to purify your body of excess kapha. Sweet, sour, and salty foods can include some essential foods, which is why intake should only be restricted. This could include foods like oranges, pineapples, grapefruit, kiwi, sour cream, cheese, cashews, and pistachios. Most processed foods contain salt, sugar, and artificial sweeteners and should be avoided. Focus more on light fruits that are not sweet, including the likes of apricots, figs, berries, prunes, and pomegranates. Limit your intake of heavy or sour fruits such as oranges, bananas, and avocados. Herbs and spices like ginger, clove, and fenugreek are some of the best ingredients for balancing kapha, but you can use the entire range of herbs and spice. While you have access to a whole range of herbs and spices, you need to limit intake of salt and mayonnaise. Do not drink water with your lunch as this will dilute your stomach acids and impede digestion. You should also avoid lassi and chaas as lunchtime beverages as milk has an aggravating effect on kapha. 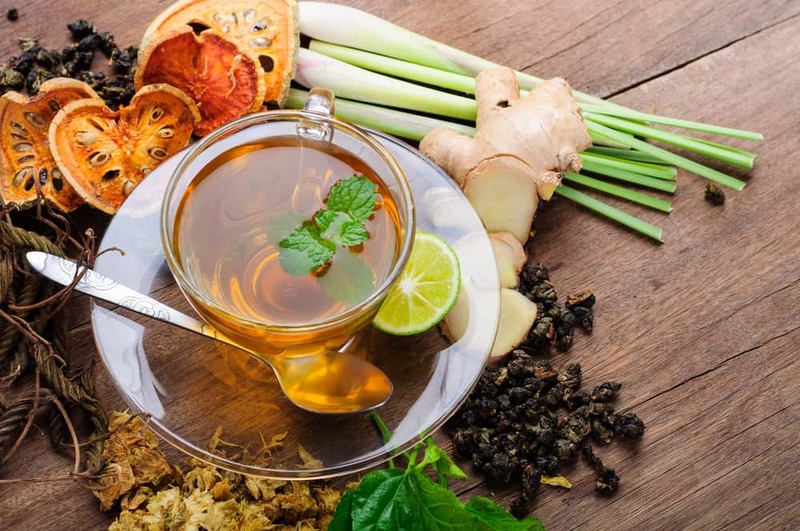 However, you can have a cup of freshly brewed herbal tea in the afternoon to pacify kapha imbalances – ginger, clove, and fenugreek are some of the best ingredients for balancing kapha. Kapha imbalances often cause lethargy and leave you feeling dull and foggy. You may find it difficult to wake up in the morning and when you are done with your work day, you just want to get home and laze in front of the TV. However, skipping your daily workouts is a bad idea as exercise helps to balance kapha. In fact kapha individuals should opt for high intensity workouts in spring to ensure that their doshas remain in balance. Kaphas also tend to gain weight in spring, which is one more reason you should stick to your exercise regimen. Kapha qualities include cool, sticky, and heavy, so pranayama techniques with opposing qualities help to prevent and treat this type of dosha imbalance. Bhastrika (Bellows Breath) increases the flow of prana through the body’s energy channels (nadis) and reduces congestion in the lungs. Bhastrika is one of the best techniques for balancing and harmonizing kapha. Some of the best yoga poses for kapha imbalances include Sun Salutation (Surya Namaskar), Tree pose (Vrksasana), Triangle pose (Trikonasana), and Upward Plank pose (Purvottanasana). These yoga asanas are ideal for kapha individuals as they focus on warmth and stimulation. In addition to diet and lifestyle changes, you can also use natural Ayurvedic herbs and formulations to prevent and treat kapha imbalances. Triphala tablets and Brahmi extract are excellent Ayurvedic remedies for kapha that can be consumed on a daily basis during the months of spring. Keep in mind that Ayurvedic herbs and formulations can help to prevent and treat kapha imbalances but lifestyle and dietary changes are necessary to ensure that they have the desired effect.